Meet my friend Nicki. While I take to the roads and trails here in the North East of England, she tackles the roots, dust and mud in the southern parts of Australia. While she sweats under the unforgiving sun, I’m wrapping up to face the frost. Running Up Top Down Under is a conversation between two runners at the opposite ends of the earth. An insight into two writing runners and proof that when it comes to running, there’s always someone in the world who understands. I’ll still blog here and let you know when there’s something you might be interested in ‘Up top or down under’. It promises to be an adventure. So check it out and let us know what you think. A slight chill in the blueness kept me moving, and numbering the days left for shorts and a tech T. This was just a run for the hell of it. A couple of miles before breakfast, exploring the waterfront of an unfamiliar place, just happy to be awake, alive and enjoying the chances of new experiences that travel throws in your way. It was my first trip to Canada but I doubt it’s my last. We enjoyed the friendliness of the welcome, the food,the ease of getting around and the differences we found in each new place. We have taken a trip into the mists of a waterfall, watched puffins and penguins swimming, cycled round a race track, eaten dinner in a revolving restaurant and stood atop a glass floor looking down hundreds of feet below. I hope to blog the experience in more detail now I’m back. I did manage a small bit of exercise while I was away. 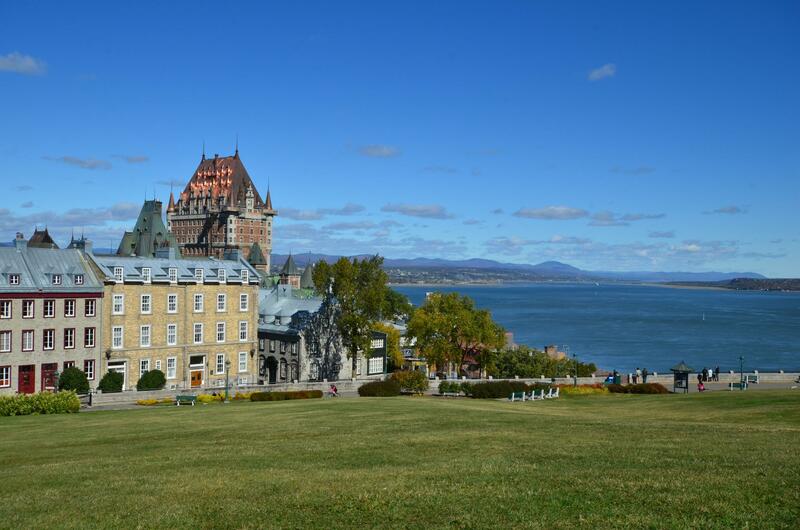 A huge amount of walking to explore Toronto, Ottowa, Montreal and Quebec. And when the hotel has a heated outdoor pool that no one else seems to want to use, it would be rude not to put in a few lengths, non? In Montreal, we also hired bikes and took them for a spin on the Formula One race track, which was great fun. It feels an age since the Great North Run. A flurry of a weekend, almost too full of excitement, emotion and busyness. And I was ready for a training break afterwards. Once again it marks the end of my training year and I’ll no doubt reflect on that more in time to come. Right now, I’m glad to be back in familiar surroundings, catching up with what my friends have been up to, settling back into cooking for ourselves rather than eating out and tackling the mountain of washing. But my mind is full of memories, sights, sounds and smells – another kaleidoscope of experiences for the jars in my memory store. They shine and sparkle like the touch of light on a waterfall and smell of cinnamon and pine. I’m very happy to have them. 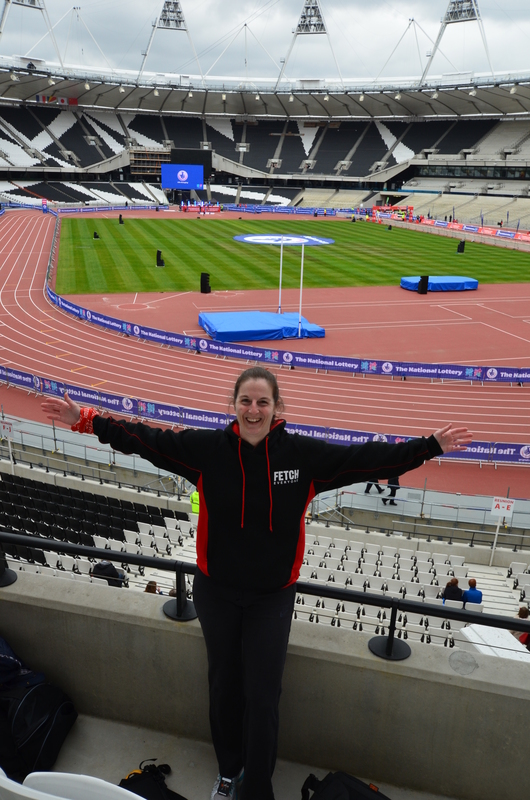 A few random thoughts to record before they’re forgotten as I find myself reliving and re-remembering the Olympic Park Run, trying to make it real. We were either incredibly lucky or something special was happening in London. It felt like everyone had been on a great customer services training course. I’ve never experienced that before. I like the city and its myriad opportunities, the fruit and veg stalls on the streets and the fact that you can taste a different cuisine every day of the year. But it’s not the city for me. It’s too fast. Too impersonal. Too cold and sharp and ambitious. But last weekend I got a glimpse of its warmer side. Maybe it was the previous weeks’ sunshine. Maybe it was the Olympic spirit. Maybe it was just chance. The mainly young people whose job was just to be there, with their foam hands directing traffic, they were smiling, relaxed, like it was the best job in the world. The guy who told us to look out for the people in ‘salmon vests’ laughed when we said they were pink and insisted they were salmon with a wry smile. Inside the park there were signs of home. A runner with a sign saying Geordie racer on her back. A banner for Sunderland Strollers running club. I waved like a loon and blew kisses to the crowds, enjoying my ‘victory’ lap before I hit the sprint button for the last 100m on the track. There was never any chance I was going to come out of that stadium without a smile on my face, but those little touches absolutely made my day. Hold on to whatever that magic was and show that face to the people who will be flocking in their thousands to the games. When it’s busy and crowded and people don’t know where they’re going, keep your tempers and show those smiles and you’ll do the same for thousands of others. After our weekend in London, we took advantage of being so far south that popping over to France in the car wasn’t such a long haul drive. We found an amazingly stylish boutique B&B called Maison de Plumes and stayed there for a couple of nights, exploring the local area. It’s an area we’ve driven through as quickly as possible in the past, hitting the autoroute to get further south into France or branching out to the beaches of Normandy and Brittany. The rolling pastures and windfarms didn’t seem like French countryside, but the space and time just to be and explore was a welcome break. Not to mention no chores, no cooking, no cleaning. We were warmly welcomed by Richard and Vanessa at Maison de Plumes and made to feel very at home in their lovingly renovated house. It is an absolute masterpiece of elegant art deco style. 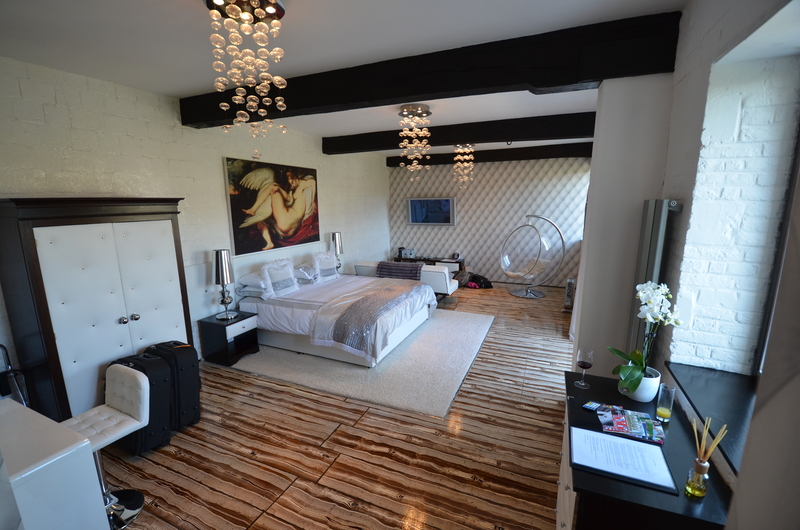 Each room is very different, with its own character, but all are sumptuous, luxurious and incredibly stylish. On one night we were treated to a fabulous five course meal, cooked by Richard. Great local food served with the same flair and elegance that Vanessa has lavished on this wonderful, relaxing place to stay. Highly recommended. We explored some good museums and learned more about life under occupation during WW2 in a bunker used to launch V2 bombs. The films, footage and particularly the drawings of the prisoners of war really made me understand the war machine, the industrialisation of the processes and the human labour involved. Next time I read Tolkein, it will paint an even more vivid picture. I ran too. Just a little bimble for a couple of miles around the local village one evening, frightening the locals with my Fetch top. And we ate very well. Local, seasonal food. Mussels and chips served within sight of the sea. Smelly cheese and sausages. But although the French pastry is world renowned, and I enjoyed it while I was there, I don’t think I could take any more bread. Dear me, but I was craving porridge for breakfast! It was quiet too. Unnervingly so. It’s early in the season and we stayed mainly in the Nord pas de Calais region, which is not really a top tourist destination, but we were often the only people eating in the local bistro and one of only a handful staying in the hotel in Montreuil the night before we came back. It was a long drive back, broken up with a stop off to see our friends Bob, Carol, Sophie and William for an hour before ploughing our way North. Gary drove all the way, so I drifted into a doze and daydreamed. And so now, here I am, back home and glad to be back, enjoying the long weekend. And getting ready for another race. My home race, my first race and a familiar 10k course along beside the sea. 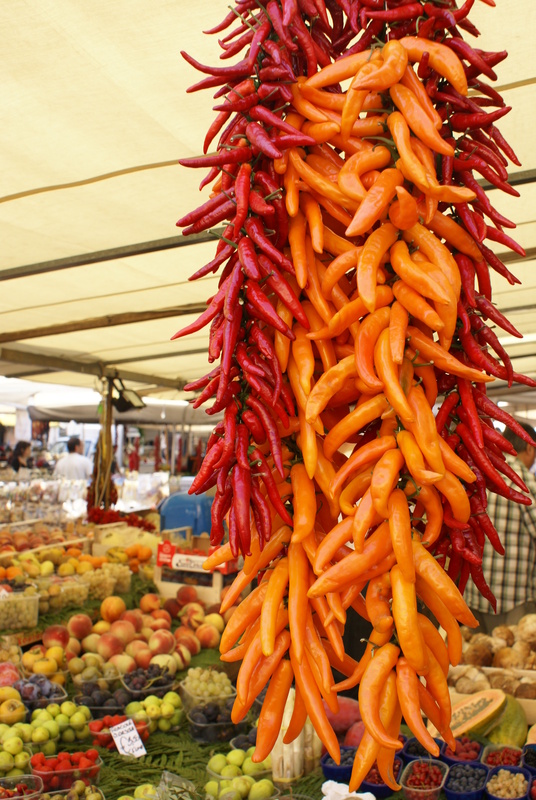 Our last day at leisure in Rome and we make our way to the market at Campo de’ Fiori. Fresh bright produce tempts the eye and taste buds, a fusion of colour and smells. Red tomatoes, peppers and chillies set off by courgettes, romanescu cauliflower and bunches of basil, as peaches nestle in between the mushrooms and salad leaves. We would eat like emperors here. We stop at the nearby Caffè Sant’Eustachio, which has been serving espresso since 1938. Gary says it’s the best he’s ever tasted. From the market we go to the national museum, which surrounds a square designed by Michelangelo. After some messing around depositing our bags and trying to juggle maps and cameras, we begin to explore the maze of the museum. The most impressive objects are the Roman statues and figures, then the plaques and signs that would have adorned the streets of this ancient city. Memories of school day Latin come haltingly back. It would have been much more fun deciphering these stones than reading text books. The museum also houses art and sculpture from later times. But we grow weary of treasures and history and the confusing layout and finish rather hot and tired. A return to yesterday’s lunch spot revives us. We’re recognised and welcomed and offered the dish of the day which proves to be mussels and clams and absolutely hits the spot. A more relaxed afternoon of wandering back through the streets before we head out for our final pizza and say an evening farewell to this wonderful, friendly city. It’s back to the Colosseum this morning, arriving early to beat the crowds. 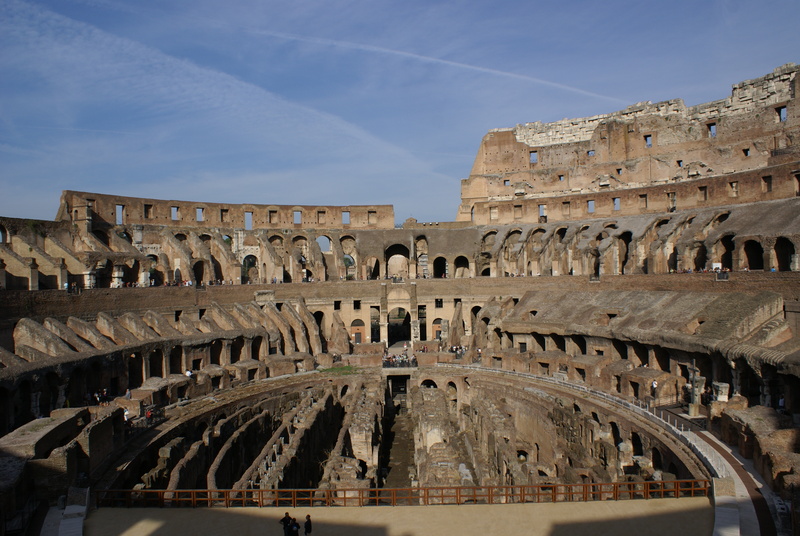 We pause in the wide corridors and then enter the arena, beneath the Roman sunshine, imagining the roar of the crowd and the clash of swords and shields. The shape of the arena is so familiar, it’s easy to make sense of the games, the battles, the shows played out here. The archeology has unearthed behind the scenes too. Rows and channels for ropes and pulleys that housed the special effects and surprises to thrill the audience. We peer down on the modern day players, dressed as Romans and earning money from tourist pictures, talking on their mobile phones. As we leave the Colosseum we spot Fabio, our Segway tour guide with a group on their bikes and say hello. 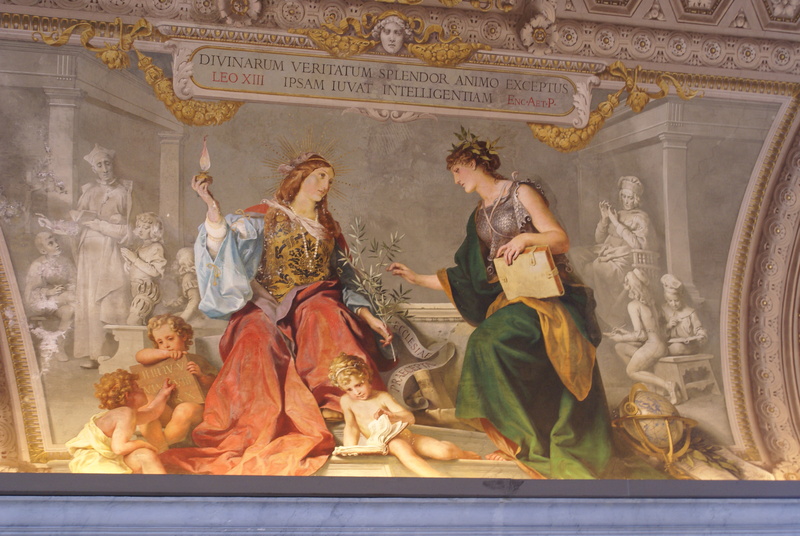 We head to the Aventine hill, site of grand homes and palaces of Rome’s ancient senators and rulers. The shady trees and views make this a pleasant spot away from the buzz of the city. We visit an old house where some of the wall painting have been preserved, the rich colours still vibrant after thousands of years. Through the gardens we emerge into the Forum, finally on ground level with the site we’ve looked over before. We take a walk along the stone paths of the Via Sacre, imagining the long crumbled temples and a street busy with stalls, people, sounds and smells. By now we’re hot and and ready for a break out of the sun. We follow a recommendation and go in search of a nearby restaurant for lunch. La Taverna dei Fori Imperiale presents one of the warmest greetings and the best meals of our trip. Veal saltimbocca, Roman pork with truffle oil and salad. A great find. Happy and full, we head back to the hotel for a break before venturing out for our own cooking experience. We meet Natalya originally from the Ukraine, now living in Rome, and begin a walk around the city’s Jewish quarter, home of real food and real people. We stop at a butcher’s and a cheese shop; snack on home-made pizza and learn some more local history before making our way to the restaurant to meet Chef Fabio and follow him to his home with views high above the city. Our lesson is more of a prep and ask questions, trying to get a word in edgeways between Rhonda and Julie, two American women who are also taking the class. But we make our first pasta and turn it into ricotta and courgette filled ravioli and pasta twists eaten with a ham and pecorino cheese sauce. We finish with a dish of ripe peaches soaked in white wine. The evening passes quickly and we walk through darkening streets still full of life, back to our hotel to sleep of a day of magnificent food. We’re up and out early this morning in a bid to beat the crowds to see the treasures of the Vatican museums. Foxed at first by the metro and a lack of change, we eventually approach the vast walls around the museum. 45 minutes in the queue and then the numbers inside are overwhelming. In a gallery filled with marble busts and statues, I declare, “They have too much stuff”. It’s only the first room. We shuffle through room after room of unimaginable treasures. Paintings and tapestries, ceilings, marble floors, ceramics, vases, sculptures and mosaics. We are drunk on opulence. And ever forwards, forwards. Shuffling through the narrow doorways, crammed and packed and shoved. All driven on a strange kind of pilgrimage towards the treasure at the centre of the maze . At last we reach a small dark doorway and emerge into a vast space. Impossibly high above me, figures float in the air, draped in rich jewel colours. They reach down and take my breath away. Giant men, women, gods and sybils confuse the dimensions and send my head reeling. Beyond human figures made real by layers of colour and paint. I am rooted to the spot and cannot look anywhere but up. Eventually, senses stunned, I turn away and move on. The following rooms and corridors are crammed with art treasures, that now seem flat, pale and insubstantial. 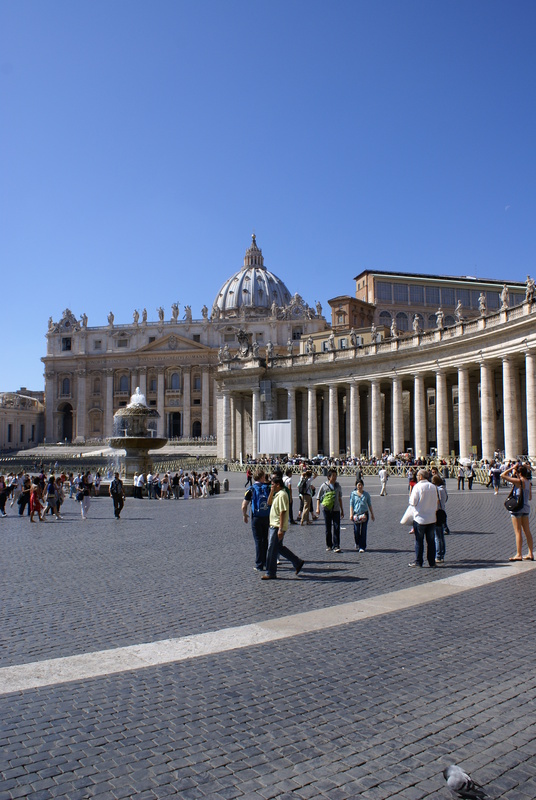 Museumed out, we rest for a while and grab a mediocre slice of pizza before heading to St Peter’s Square – a huge clearing surrounded by colonnades and, at the centre, the great dome of the church itself. In the sunshine fountains sparkle and a child plays scattering pigeons. We enter the church, which is Tardis like – even bigger on the inside. In the dimming light, immense statues ornament the elaborate ceiling. An elephantine cage of twisted black ebony surrounds the main altar. We follow a group around behind one of the figures in an alcove and descend into the crypt. The surprisingly light and airy tomb houses the sarcophagi of former popes and kings and the relics of St Peter himself, hidden far behind the glass. Once more out into the open, we walk foot sore, hot and weary along the river to the Castel St Angelo. Inside we wind through cool dark corridors, ascending in loops to emerge in the castle rooms, to see the armour, guns, cannons and spikes of battle. A Michelangelo angel with bronze wings overlooks the courtyard. We enjoy more glorious views over the city from this fortified base, before making our way down down down to the bridge of angels and back to the modern world. Through streets of luxury shops we emerge at the Spanish steps, a flutter of colour and custom in the afternoon sun as street vendors try to sell us roses. I think of two lovely people for whom this will always be a special place. But we are weary and don’t linger too long, taking the metro back to our hotel. After a rest and refreshment we head out in search of a recommended local restaurant, Nido D’Abruzzo. Its style is basic, old school, tatty even. But the pasta is fresh, rich and delicious, like you wish your mama used to make, served by an old guy who could be your Italian grandpa. And the fish I have to follow is one of the tastiest, simplest dishes I’ve ever eaten. A real treat of a meal.